my head is filled with junk. i have recently been bemoaning to craig and mike (and anyone else who'll listen) my inability of late to put a sotry together the way i used to. oh, sure, i'm fairly happy with the one that's currently running in the perhapanauts, and there are a few other things i'm working on right now that give me that same jolt that writing something you enjoy can bring. but it comes a lot harder than it used to. there was a time when i felt i was on fire and all the elements of a good story would just fall into place in my head. now those elements take a little more rearranging, a little more coaxing into place. my friend dave will say it's 'cause we're getting older and our memories are going, but i don't buy that. first, because i don't think that storytelling part of my brain has anything to do with my memory. totally different muscles. second, because i KNOW right when this slowing down started, know that there was a pretty powerful emotional...event, i guess, (a break-up) a few years back that left me with a writer's block that shut down almost all production in that area of the plant. but mostly the reason that i don't feel that it's my memory is 'cause there is just SO MUCH USELESS INFORMATION IN THERE THAT BOGGLES EVEN MY MIND!! I"M BOGGLING MY OWN MIND!!! i'm watching tv the other day and a commercial comes on for this hair restoration process by bosley. in an instant, my mind does this. bosley was the name of charlie's intermediary on "charlie's angels". bosley was played by david doyle. they originally wanted tom bosley for the role. he was busy being howard cunningham on "happy days". coincidentally, the two played in-laws at odds on the short-lived, 1972 mixed-marriage sitcom, "bridget loves bernie", starring david birney and merdith baxter birney. that's what my mind went to first. either way, that's where my mind goes; to all sorts of bizarre, needless, worthless information that could only help me if i lucked out with those categories on "jeopardy". the book, america the book, by jon stewart and the daily show gang, asks the question "how many supreme court justices can you name? 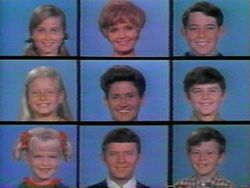 now how many of the brady bunch can you name? what does that say about you?" 4 supreme court justices (but that's mostly 'cause they had just named them in the previous chapter in the book!) but i can easily conjure up ALL OF THE BRADY BUNCH!! AND THEIR REAL NAMES!! and what was the dog's name on "the brady bunch"? what was the dog's name on "the partridge family"? what was the dog's name on "the ghost and mrs. muir"? where did anne marie's parents live on "that girl"? sure, imdb and google and the rest of the internet can put any of that stuff at your fingertips in a hearbeat--but it's rattling around in my head constantly! and i can't help thinking that if there were a real pensive somewhere that i could off-load some of that garbage maybe i could write something good for once. so, of course, this leads me to throwing out a trivia challenge. unfortunately, 'cause i don't have a tv show like" jeopardy" or "who wants to be a millionaire? ", we'll hafta do it old school. like a take-home test using the honor system. so NOT using imdb or google or the internet or turning on your tv or referencing your 2006 leonard maltin movie guide, jot down your answers to these and write 'em in to the comments section (or, of course, put 'em in an e-mail and send 'em to me at todd@perhapanauts.com) and we'll see how everybody does. after this, maybe you guys should send in questions to me and we'll see if my head really is filled with fluff...? 1. what was the dog's name on "the brady bunch"? 2. what movie's poster touted "just when you thought it was safe to go back in the water"? 3. prior to "the x-files", david duchovny played an fbi agent on another tv series. what was the show? 5. what was the dog's name on "the partridge family"? 6. how many of each animal did moses take on the ark? 7. what was the dog's name on "the ghost and mrs. muir"? 8. what was "alf"s real name? 9. name the 6 james bonds? 10. where did anne marie's parents live on "that girl"? Don't feel to bad about only knowing 4 Supreme Court Justices, as Bush has been appointing some fairly middle of the road non-descript, never heard of them before the nominaiton, types. I could only come up with four, and I'm in the business. As for the story telling, maybe the problem is that you've already told so many great tales, that it becomes harder and harder to find unwalked trails for you in storyville. 8) It was a very jokey, Jewish name, but I can't remember. I do remember the cartoon which was set on his home world, and they called him by his real name there. That counts for something. I think number 6 is a trick question.... It was Noah that had the Ark. 7. In the movie or the tv show? 8. I just watched an episode of "My Name is Earl" were they mentioned his real name, but I can't remember it. He did come from the planet Melmack and liked to eat cats. 9. Connery, Lazenby, Moore, Dalton, Bronson and Craig. But there were seven. David Niven. Make it eight if you count Woody Allen's James Bond, Jr. Boy, I'm a lazy reader. Didn't notice you wouldn't let us use dweeb. Damn, Jaws 2!!! Trick question. I should know this. I'm bad. Moses would have taken two of each if he was Noah, but he wasn't, so he took none. Don't remember, but I did just order the nifty Match Game dvd from amazon.com. God, I love that show. Connery, Moore, Lazenby, Dutton, Brosnan and that new guy. Craig. Comet....or is that the dog's name on Full House? I'm gonna guess Jaws or Jaws 2. Moses didn't take any animals on the ark. Noah did. Alf had a real name? Hi Todd! Man, I love this idea... I'll give it a shot! 1. what was the dog's name on "the brady bunch"? Tiger I think... I never really watched the BB much, but I think I remember Tiger, kind of a shaggy dog right? 2. what movie's poster touted "just when you thought it was safe to go back in the water"? Jaws 2? 6. how many of each animal did moses take on the ark? Noah did the ark thing, and Noah took 7 of each "clean animal" ... not just the 2 that is usually depicted. 7. what was the dog's name on "the ghost and mrs. muir"? Tiger... Come on, give me a break!!! 8. what was "alf"s real name? Crap, I remember he was from Malmac (SP?) and he liked to eat cats, I even remember the cartoon that took place on Malmac (where they called him Alf) I know that Alf stood for "alien life form", the father was Willy (who was busted in a crack house a couple (maybe 5-10) years ago.... there was a very special Alf where one of the family friends had a problem w/ Drinking, and she saw Alf and thought he was a figment of her imagination.... that really doesn't make up for me not knowing his name does it. 9. name the 6 james bonds? Are we talking about the Actors or movies? Actors there have only been six (I think) Sean Connery, George Lazenbe, Roger Moore, Timothy Dalton, Peirce Brosnan, and Daniel Craig... Movies : From Russia w/ Love, You only live twice, Live and Let die, The Living Daylights (? ), Tomorrow never Dies (? ), Never Say Never(? ), Dr.No, Man w/ the Golden Gun, Moonraker, Casino Royal, Goldfinger (this may have been a video game... I'm getting them all mixed up), Golden eye The Spy who loved me. I think I have at least six right answers in there somewhere. Looking forward to the answers, can't wait for more! It was me, I was just tryin' to keep the answers all for myself!!! I guess I should clarify me... it was Rich!